I leave my house for my office job at 6:50am and get home at 5:30pm (at the absolute earliest – if I’m lucky!) so I need my makeup to last me about 11 hours throughout the day with little to no touch ups! It may seem like a lot of products but this only takes me 10 minutes (max!) to apply in the morning. 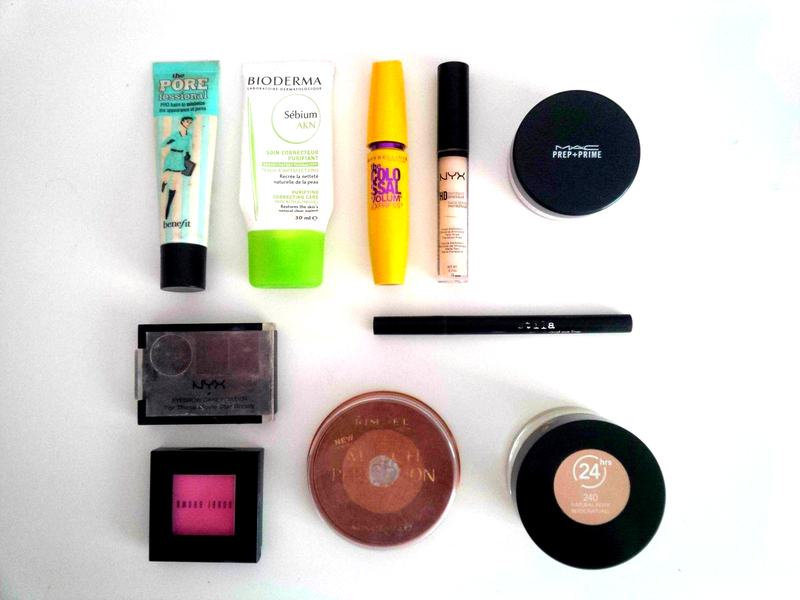 Here are my tried and true go-to daily makeup products. Bioderma Cream: This is my very first step in my make-up routine on any given day. This helps to control the sebum on your face throughout the day and I have found that it really does make a difference! Plus it also helps in smoothing out your skin. Porefessional: This is the primer that I am currently using on a daily basis as I am almost out of my Revlon Photoready! This is a silicone based primer that gives you a nice even base for your foundation. For all my Aussie girls out there – you can order this on the US Benefit website at US prices! Revlon: This foundation is on the heavier side of the scale but hey, 11 hours remember? 😉 This is one of those products that I have been re-purchasing for years and will continue to do so when I run out! I am still on the hunt for my holy grail foundation but for now, this is a geat and affordable one for the work week. MAC Setting Powder: I had heard such amazing things about this product and for years but couldn’t bring myself to make that purchase as it is pretty pricey and for such a tiny tub! Little did I know, a little absolutely goes a long way and you do not use much product at all through application. This is one of my favourite setting powders by far! Bronzer: I am currently alternating between the Too faced Chocolate Soleil and the Rimmel. I love these products and find them super easy to blend out to create that natural contour. Bobbi Brown Blush in Peony: I am always using a different blush but I find that this blush shade is the perfect natural light pink shade for every day use and definitely appropriate for the workplace. NYX brow powder: This is not just a product that I use every day during the work week but is a product that I use pretty much every single time that I do my make-up. It is so affordable and lasts forever. I ran out of the gel quite a while ago so just refill the little spare space with whatever gel I currently have – preferably a coloured one! Stila liquid eyeliner: I only use this on the outer third of my eye and also draw just a slight and subtle wing. This eyeliner is perfect for work as it lasts all day long and is a nice dark black shade. The colour is so dark that you do not need to draw a thick line along your eyes to really define them. Maybelline Colossol Mascara: This is my tried and true current holy grail mascara. I have re-purchased tube after tube of this product and will definitely continue to do so after my current one runs out or dries up! It works great to separate my lashes and gives you volume and length. I use 2 coats of this on a daily basis. MAC Highlight: I just use this gorgeous product on my check bones as a highlight and on my brow bone also as a highlight. I definitely recommend this product! It is such a stunning shade and lasts FOREVER. I have been using it constantly and you cannot see any signs of use! Mac paint Pot in Painterly: I use this product as an eye primer and it is the ONLY eye primer that I ever use! It is pigmented enough so that you can wear it on its own and it just makes your shadows pop. I use this product on my eye lid and all of the way up to my brows. Stila Kitten Highlight: I use the lighter pinky shade on my lid, just applying it with my ring finger and also apply in the inner corner of my eye as a highlight. This shade is stunning and the PERFECT eyeshadow shade! I will definitely re-purchase. Buck Eyeshadow (from Naked1 palette): I use this shade in my crease and blend it out. This is the perfect shade to deepen up your crease and give you extra definition in your eyes. If I really want to define my eyes, I will also use this on the lower lid on the outer third of my eye. Unfortunately not right now but that is something that I am definitely on the hunt for! As soon as I find a dupe – I will definitely be writing a post about it 🙂 thank-you so much for reading!! I’ve never used a brow powder before, how does it work compared to brow gels? ohh! I’m definitely keeping my eyes peeled when i’m at chemist warehouse!